Weather here in Central Oregon changes on a whim. Several days of near 90 degree days last week make it difficult to remember the downpours of rain we had a few short weeks ago. The Desert Rain site was awash with puddles and mud when Barb and Tom arrived to give a tour. Last night we had a frost. Change represents motion. Desert Rain is seeing significant changes as the project moves forward. Through rain and shine, challenges, frustrations, rewards, and successes – Barb and Tom and the Desert Rain team keep moving forward. 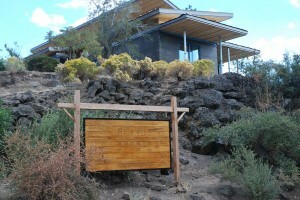 Water – essential to Desert Rain meeting the goals of the Living Building Challenge. Rain is good for Desert Rain. To meet the criteria for the Water Petal of the Living Building Challenge, water must be collected on site for all domestic and irrigations use, including drinking water. Desert Rain is outfitted with rainwater collection systems on all of the buildings. The water will be harvested and stored in a 35,000 gallon cistern. 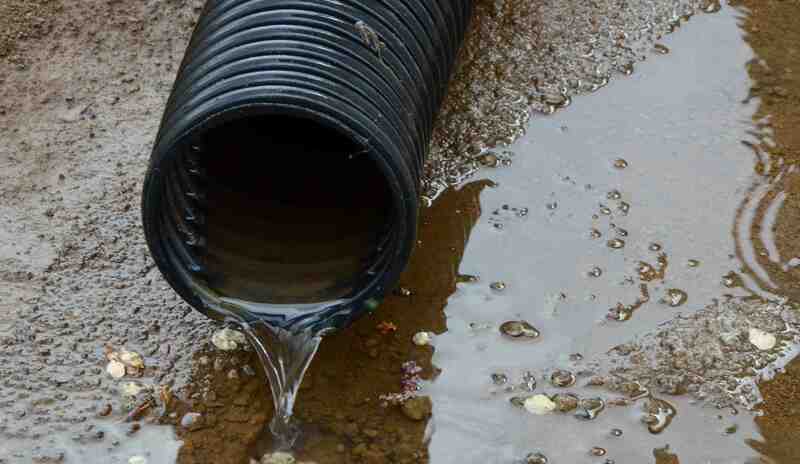 Wastewater must also be processed on site. Good news came today in the form of permit approval from the Oregon Department of Environmental Quality for a composting toilet facility. There will also be a bio-reactive, constructed wetland to treat the graywater for use in irrigation. 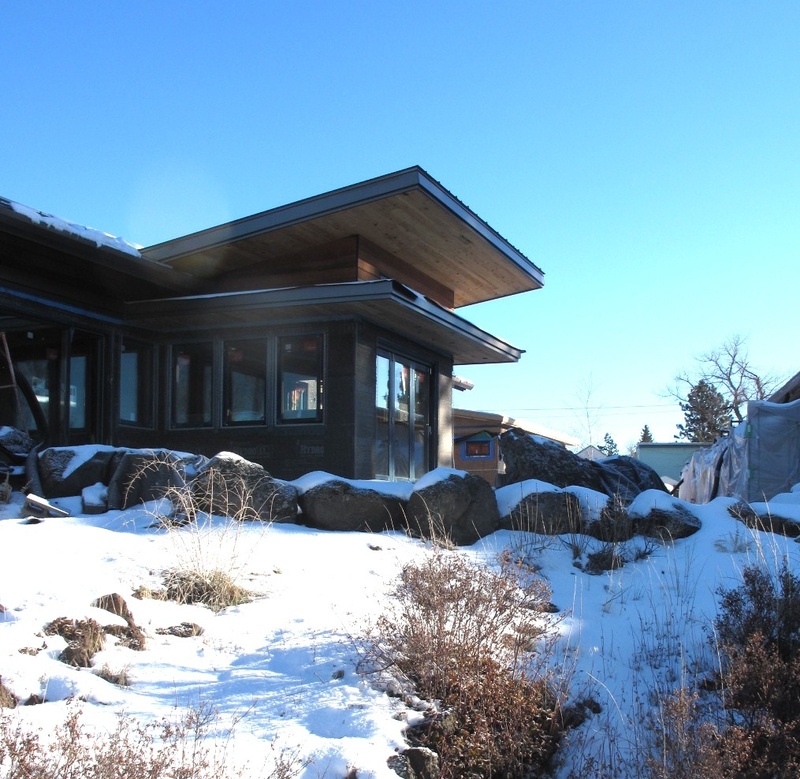 The water permit is still pending with the City of Bend. Juan, with Elite Plastering working on the second coat on the garage. The base coat and second coat of plaster have been applied. A third and final, colored, finish coat will be added soon. 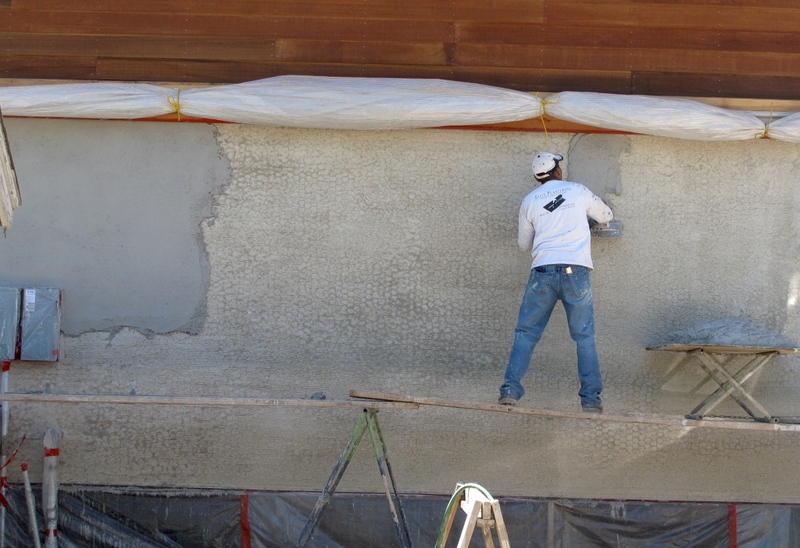 The exterior of the structures are under wraps during the plastering process so the curing can be controlled. Still under wraps. There will be much excitement when the final coat of plaster is complete and the exterior revealed. What is happening under all the wrapping? Jason is tenacious with the tedious job of tiling all of the shower walls with the crushed glass tiles from FireClay. Doug Cahail is working diligently in the master bathroom. 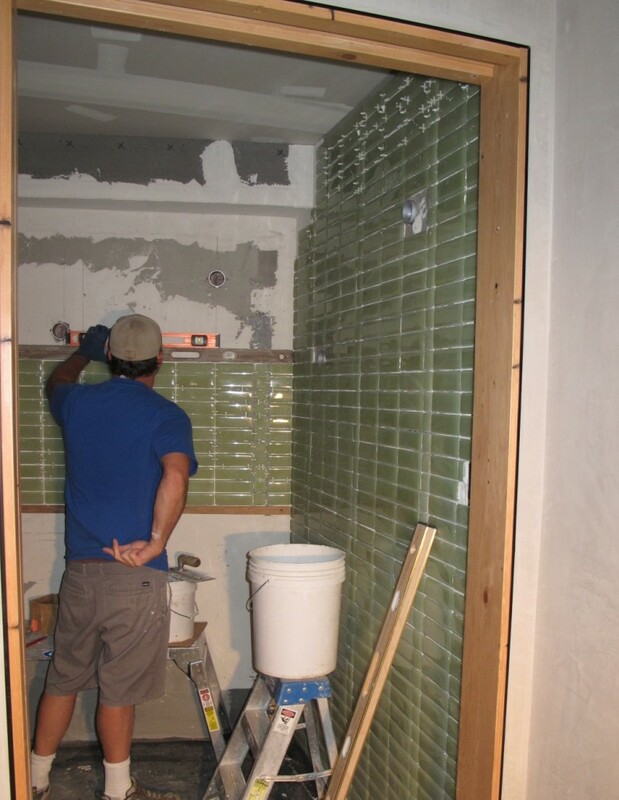 Tilers, Doug Cahail and Jason have been diligently working on installing the FireClay ‘Crush’ tiles in the bathrooms of both the ADU and main house. 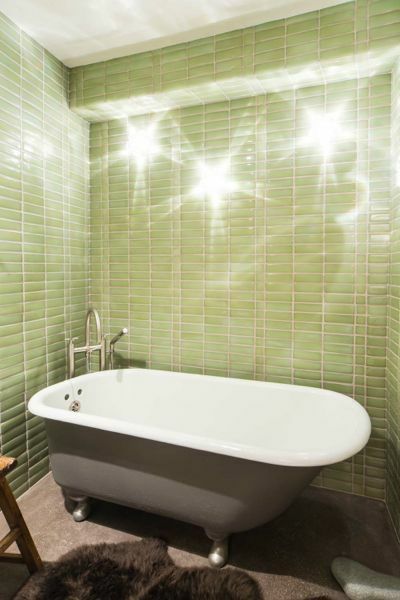 ‘Debris’ tile from FireClay was used for the backsplashes and shower in the ADU. ‘Debris’ is comprised of more than 70% recycled waste, including recycled toilets. High Desert Hardwood Flooring crew, Sonny and John, have installed the salvaged myrtlewood floors in both the ADU and the main house. In the ADU they have been sanded and finished with, OSMO, a green, wood- wax product. 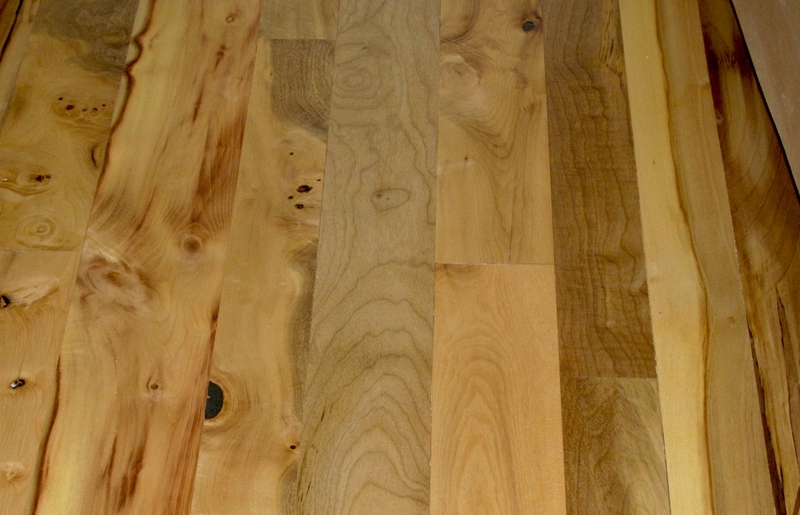 Oregon Myrtlewood flooring – the picture says it all! Gabriel Dansky and crew with Dansky Handcrafted of Bend, have been installing more cabinet bases in the dining and laundry areas. 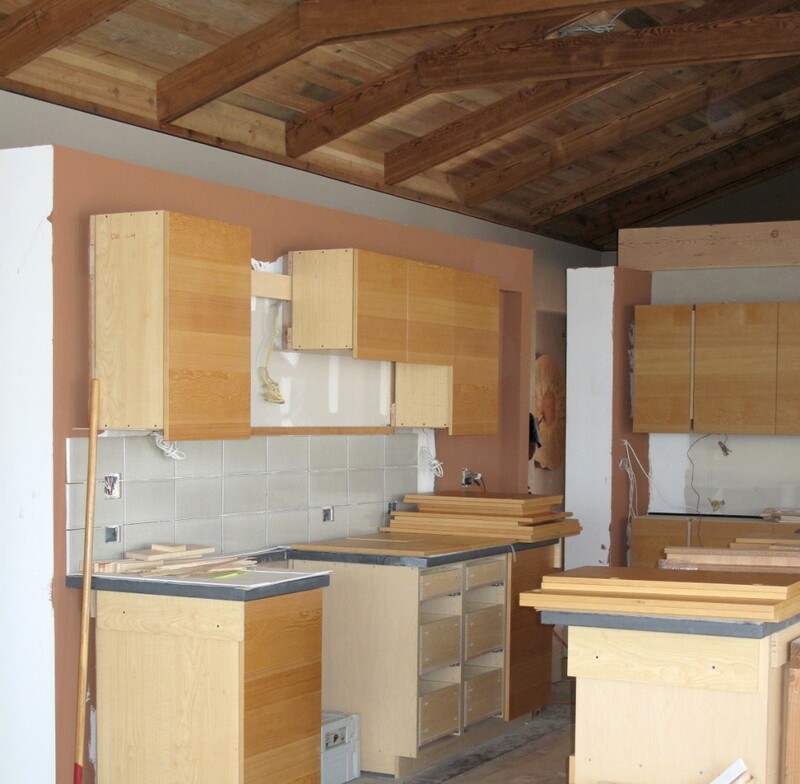 Installation of the doors on the kitchen cabinets is also underway. 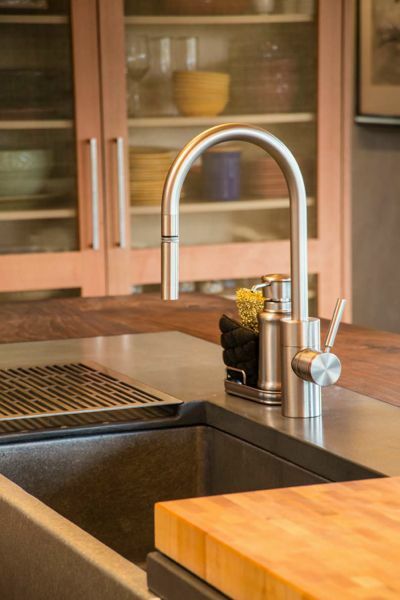 The cabinet doors are made from Forest Stewardship certified wood and finished with OSMO wood-wax. The beauty of all the elements blending together; reclaimed wood on the ceiling, FSC wood on the cabinets, American Clay plaster on the walls, recycled FireClay tile for the backsplash, and cement countertops from Cement Elegance. 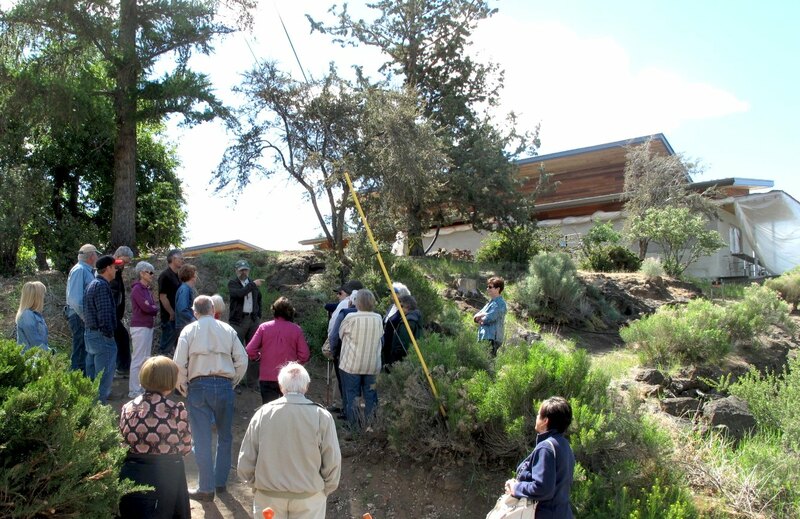 A group from the Osher Lifelong Learning Center listen to an introduction from Tom about the project before they make their way up the ‘mail trail’ to the house. Meanwhile, tours have been ongoing with groups and individuals interested in green building and the cutting edge elements of Desert Rain. Recently a group from the Osher Lifelong Learning Institute, partnered with the University of Oregon, visited Desert Rain. 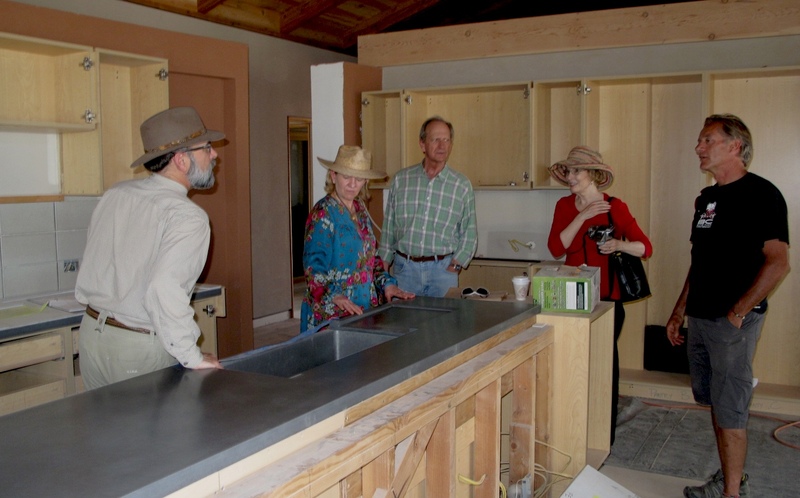 A notable visitor, Denis Hayes and his wife, Gail Boyer-Hayes also toured the site. Hayes was the coordinator for the first Earth Day Celebration in 1970. He is currently the president and CEO of the Bullitt Foundation based in Seattle. 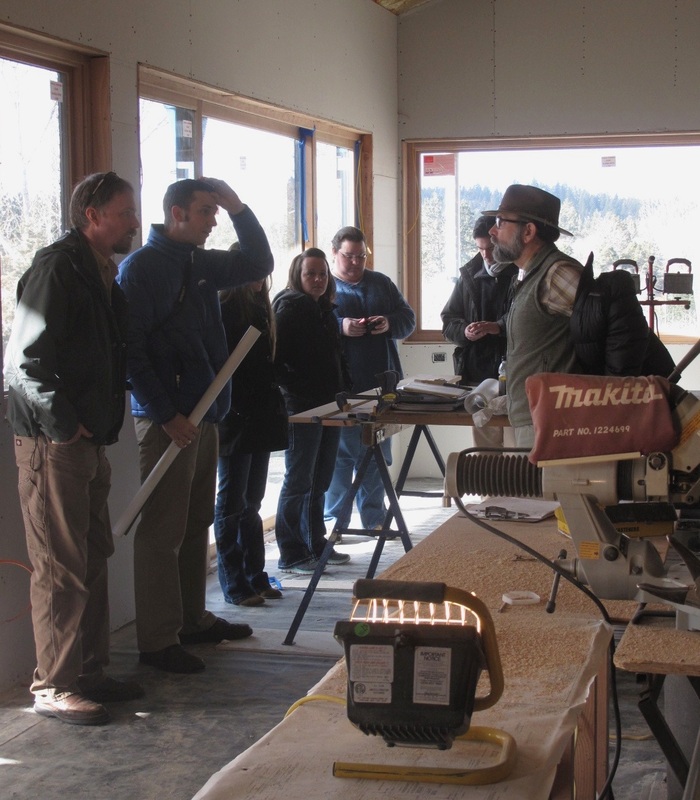 The Bullitt Foundation opened a new center in Seattle this Earth Day in 2013. The facility was built to meet the standards of the Living Building Challenge. Hayes and his wife hope to build a LBC home of their own. Denis Hayes, coordinator of the very first Earth Day, tours Desert Rain with his wife Gail Boyer-Hayes. Tom, Barb, and James Fagan, DR builder, talk about the elements of the extreme, green project. 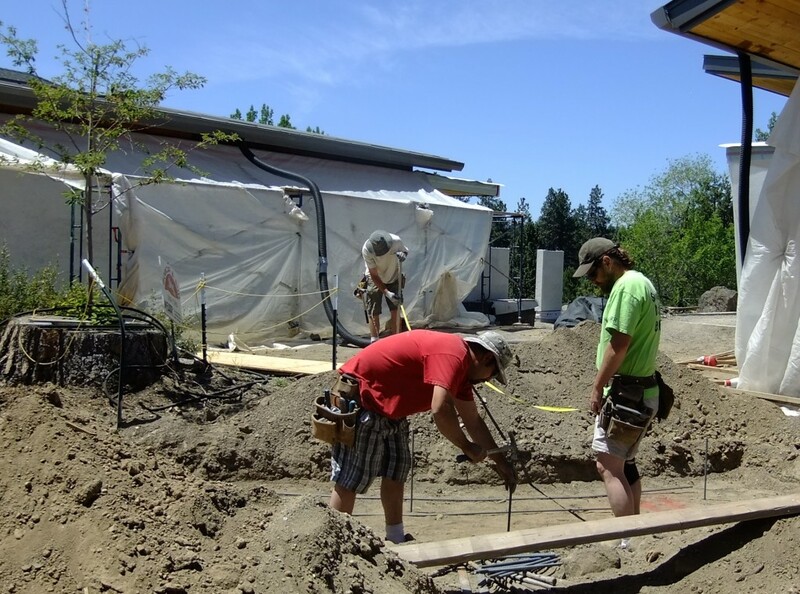 Back outside – Keith Krewson with Central Oregon Construction Contractors has returned to lay and pour the forms for the ‘Miro’ wall. The curved wall begins on the exterior, west end of the house, continues through the structure, emerges from the east end and will eventually, gracefully encircle a courtyard. A wall in flowing motion – a project in motion – flowing forward! Keith Krewson and crew have been involved with the Desert Rain project since the early phase of construction. They have done all the concrete work; the foundation, the cistern, the interior, cement slab floor, and now the exterior ‘Miro’ wall. Oregon Institute of Technology field trip listening to Tom’s tour in a warm and cozy living space, amidst the on-going construction. Last week a group from Oregon Institute of Technology in Klamath Falls toured Desert Rain with Tom. Tom’s tours are chock full of information about the project, the house, materials, the process, and the Living Building Challenge. 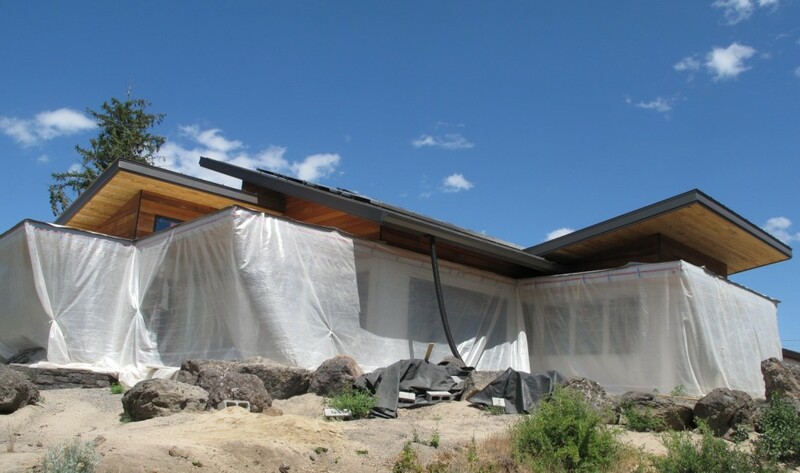 For those of you that have not yet visited Desert Rain, you are invited to come along here for a condensed version focusing on the Seven Petals of the Living Building Challenge. The Living Building Challenge is based on Seven Petals. Tom talked with the group about each of the petals. 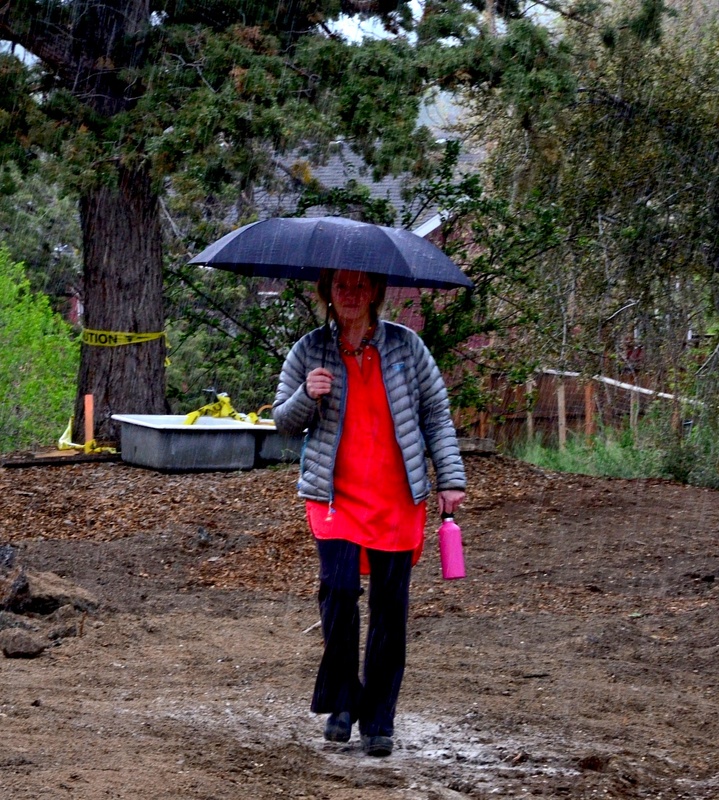 Desert Rain meets the site petal requirements by using an existing building site, being walkable to amenities, and being part of the neighborhood and community. 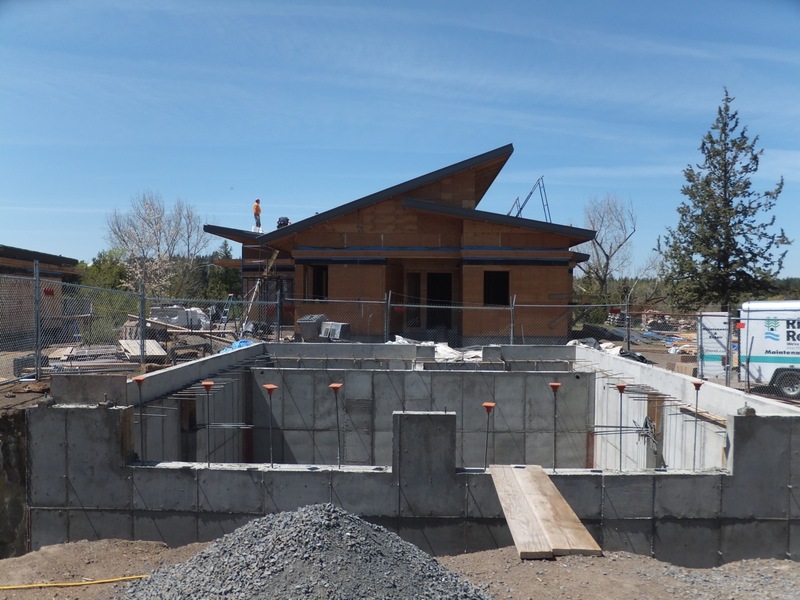 The 35,000 gallon cistern will store collected rainwater for all of the domestic water use making Desert Rain Net Zero water. “The other side of the ecological water course is handling our wastewater. The original intention was to build an underground bio-constructed wetland that would handle both the greywater and the blackwater. Current regulations won’t allow us to that. We’re still going to build one. The only thing that will run through our constructed wetland is greywater. 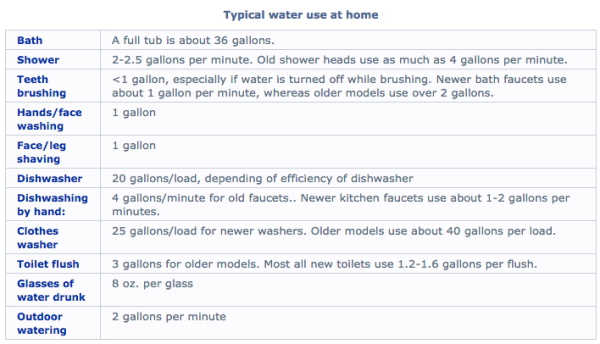 The greywater will travel from the various buildings into a collection tank that basically separates any solids. From there it goes into a small constructed wetland where it is processed using a natural process through gravel and plant root systems. At that point the DEQ qualifies it as Type ll greywater. It will go to a holding tank by the side of the garage and can be used for irrigation and water features. Basically it will be used as irrigation water or evaporated. It will be sub-surface irrigation. We are relying on the constructed wetland to purify the water. Infloor radiant heat is powered by the solar thermal system. “Then we move to the Energy part of it. The imperative there is net zero energy. We want to be not only net zero in the home, but we also wanted to provide enough energy for two electric vehicles so that our transportation is also net zero energy. Our first approach was to have as efficient building envelope as possible. Our intention is to be net zero energy or maybe overall, surplus energy producing. We’d like to be a power plant too and provide enough energy to be on the positive side. I think it’s likely. We’ll be grid connected so we’ll be net metering with the power company. We’ll use the grid as our storage device for now. 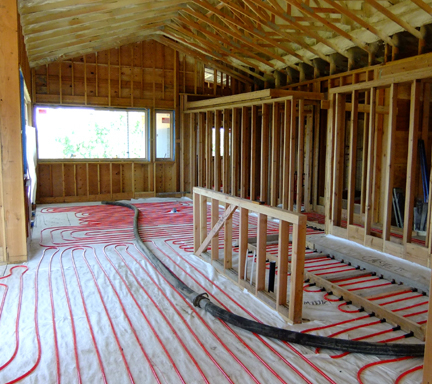 The house will be heated, in fact is currently being heated, with a solar, atmospheric hot water system with infloor radiant heat. When I say atmospheric, it is not pressurized. When there is no demand all of the water drains back to the storage tanks in the corner of the house so there is no risk of freezing. There is also a super efficient therma-monoblock heat pump that is tied into that system if there is not enough solar heat and we need a little boost.” Jim Fagan, General Contractor with Timberline entered the conversation, “ It is an extremely efficient, electric, air to water heat pump. 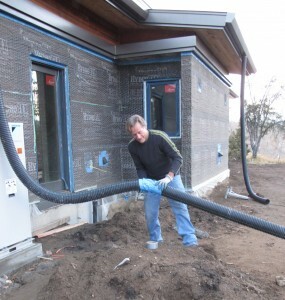 Also the domestic hot water is tied into the system.” An interesting side note: Bobcat and Sun the contractor that installed the solar thermal system said that normally on a home here in Bend, based on efficiency of the building envelope, at least 26% of the homes’ energy could be met with the solar system. The calculations on Desert Rain are somewhere in the 86 to 90% range that will be met by solar. Then there is the Materials Petal : The red list is very stringent. There are 14 chemicals or materials that are not allowed. “That’s probably been our second biggest hurdle – just vetting through materials. We have a very comprehensive process. We maintain a spreadsheet with all these questions that would have to be answered for that material. We’ve had to reject a lot of materials for various reasons. PVC is on the Red List. It is very difficult to build a home without PVC. 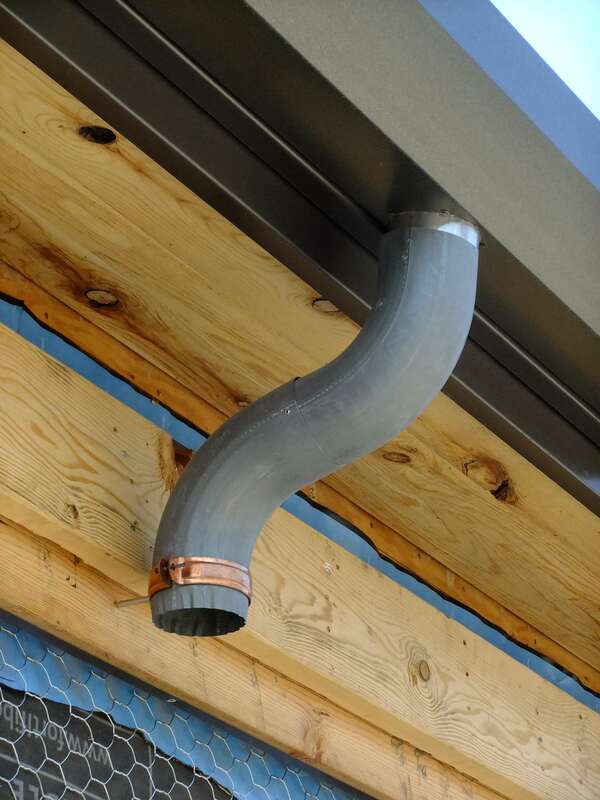 There are a couple of instances where we’ve had to get a minor exemption because there is just nothing but PVC – like some of the wiring in the house has a PVC coating. Jim Fagan comments, “there is really no other code material we can get. Another one is that there is a fire retardant in this foam that is on the red list but there is no alternative.” In order to mitigate that, we found that if you only put on 4” at a time it off gasses very thoroughly. Where as, if you put on 8” at one time it sort of traps the gas and it takes years to off gas. 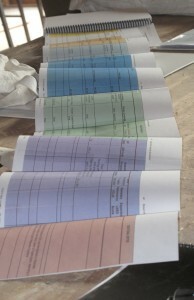 The materials spreadsheet; EVERY material considered for use on the project has to be ‘vetted’ through this extensive list of questions and approved. Jim adds, “One of the things that is required when we do get an exception, like the PVC on the wire or the fire retardant; the LBC requires us to write a letter to the manufacturer. We let them know that yes, we are using this because it is the only thing that will make our envelope what it is. But we tell them we’re not happy about it and we want them to figure out a different way to do it. It is pretty comprehensive -covering all those bases. Our stucco contractor has developed his own Oregon mix. Most of those products, at least part of them come from California or Mexico. He found all the aggregates and parts and pieces to create a stucco product that is all Oregon. That is kind of cool.” That is part of the Living Building Challenge intention, to be pro -active that way and push change, not just exemplify it but push the envelope with manufacturers and sub -contractors. 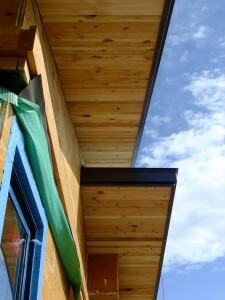 Reclaimed lumber is used on exterior soffits and all the interior ceilings. “Then we move to the Equity part – that is making things human scale and accessible. All of our homes are wheel chair accessible. We did that for a few reasons. One, we already have a couple of friends in wheelchairs and we know as part of the aging process people are in wheelchairs. Also equity refers to terms of production of materials. All the lumber in the house is either reclaimed or Forest Stewardship Certified. They certify all the way back to source, and that the labor was treated properly, and the material is treated properly. Awareness and that consciousness – we need to embody more and more. I think a lot of times we feel like we don’t have any individual power. But certainly we make a choice. I think collectively we have an enormous amount of power to make important choices and that really applies in this materials and manufacturing. This dialogue is a glimpse of the information to be gleaned from a tour. Tom and Barb very much see Desert Rain as a demonstration project and an educational tool. Tours are part of that process. Many groups have been through the site at various stages of the building process. Are you interested in learning more about Desert Rain? Send us an e-mail or desertrainhouse@gmail.com or subscribe to our e-mail newsletter at the bottom of this blog page. Tom Elliott receives a thank you gift from C.J. 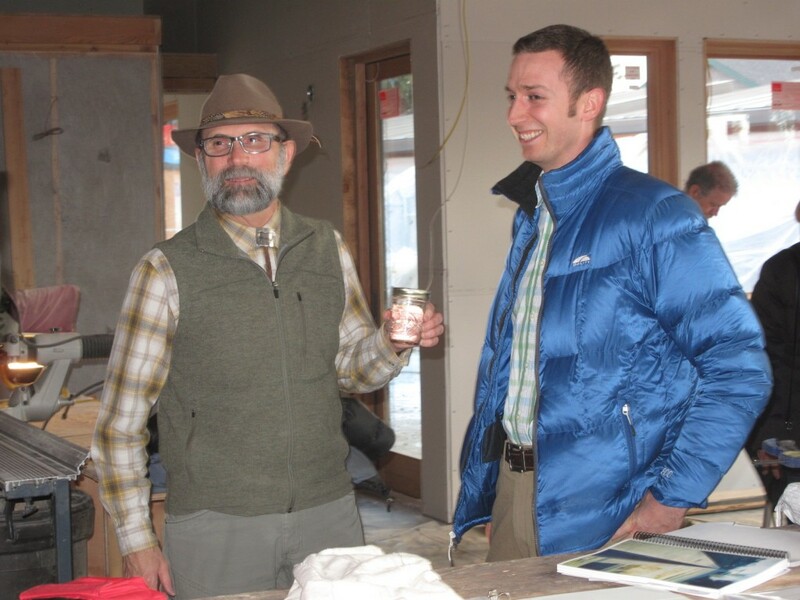 Riley OIT faculty – a pint of Klamath Basin Water to help ‘charge’ the cistern.